So these empties are not all from March, but from January, February and March. 1) First, we have Soap & Glory hand food hand cream, I finished this in early January. I have a lot of hand creams of late and I had completely forgotten about this one; in fact it had gotten over much earlier and only a little was left and when I opened it in January, it was spoilt and its oils had separated. So ya this is over now! I won’t be repurchasing this as I like to try different products but I definitely recommend it to you to try! 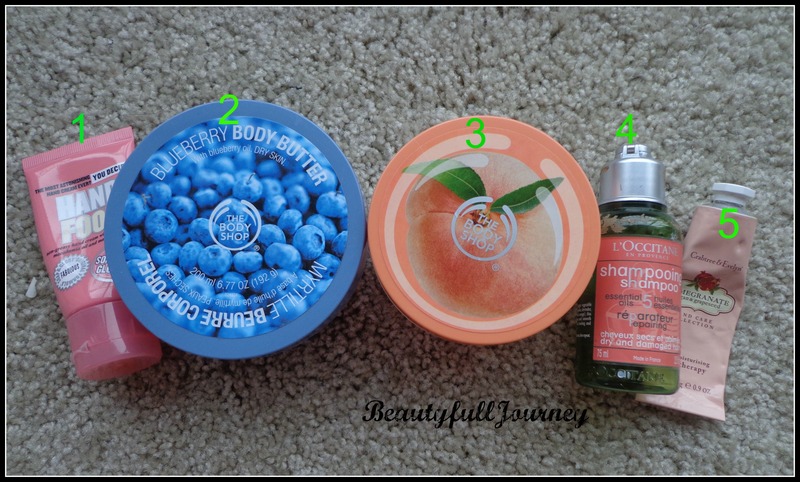 2) The Body Shop blueberry body butter ~ I have never finished a whole body butter tub before in my life!!! Eeeee, you can imagine my excitement when I finished this plus I was not really fond of this blueberry butter and wanted to finish this up asap so I used it faster than normal and here we are, with a lovely empty tub 😀 this got over in February! I’m using the empty tub to store a Lush soap now! These tubs are super useful! I won’t be repurchasing this as I did not enjoy this particular blueberry flavor much! I can think about repurchasing this, next winter maybe! Definitely will be repurchasing this after I finish my 2 other travel sized bottles of this 😀 unless I find a better substitute! I won’t be repurchasing this to try other stuff but again I definitely recommend it! 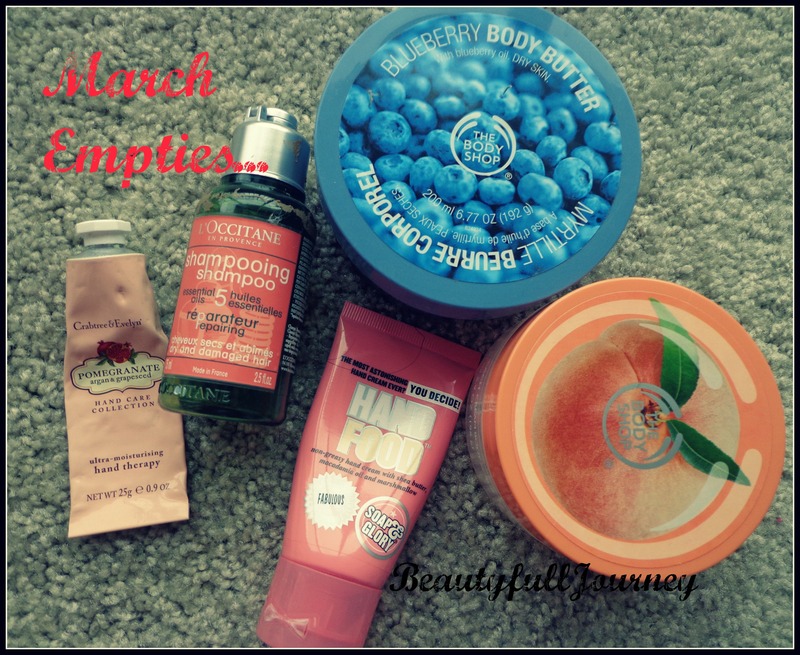 I’ve reviewed all of them except the l’occitane shampoo so you can check out the details there! Next > Ipsy Glam Bag April Review.